Phonograph dolls talk, sing and play cylinders. The Averill Company marketed Madame Hendren as a phonograph doll in 1918. The Original Madame Hendren phonograph doll was made with composition head and limbs and with a cloth body. This 22-inch doll was painted a soft ivory with painted blue eyes and a human hair wig. She had an open mouth showing two teeth and a small pink tongue. She was a baby doll that talked by means of the early Arthur motor, which has a small knurled knob to engage the on/off mechanism. Later models use a lever, rather than a knob, to turn the mechanism on and off. An exciting doll cylinder discovery was made by CAPS member Jean-Paul Agnard. Jean-Paul had purchased some Averill doll cylinders on e-Bay. When they arrived, he observed that they were in the original shipping box and that the colour of the cylinders was much darker than the familiar light blue Averill doll cylinders. In fact, the cylinders were black in colour, each in a pink-coloured cylinder box. Jean Paul then shared this information with us and the search was on for information concerning these unusual black cylinders. The Original Madame Hendren Doll came with a box of cylinders. They came in sets of six or eight cylinders. The boxes in which the cylinders were packed varied in length. One box was 10 inches long, containing five cylinders, and another box was 12 inches long, containing eight cylinders. The cylinders are black and found in pink-coloured boxes. The early cylinders had the song name imprinted on a metal plate on one end, and some had a paper label. 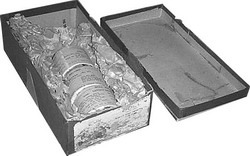 These cylinders were purchased in a packing box with the "Madame Hendren" logo pasted on the end of the box and the notation "Patented June 11, 1918." Later cylinders were a light blue colour and found in a light tan cylinder box. The familiar light blue cylinders are played by many phonograph dolls such as Madame Hendren, Mae Starr, EffanBEE and Lovums and other dolls that have the Averill motor. 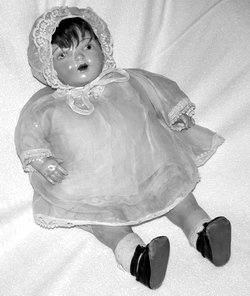 The Madame Hendren Doll was born in 1922, weighed five pounds and was 25 inches tall. 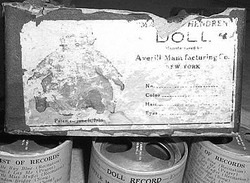 The Averill Manufacturing Company made this phonograph doll and named her Dolly-Rekord. Many phonograph collectors refer to Dolly-Rekord as the Madame Hendren doll. The Mae Starr doll is another doll that played the light blue cylinders. Mae Starr is 29 inches tall, four inches larger than the Genuine Madame Hendren. The Mae Starr doll was made from 1928 through 1944, when doll production stopped because of the shortage of materials due to World War II. On the back of the shoulder plate is the identifying name: "Mae Starr Doll". There is a rare advertising cylinder for Mae Starr titled "The Mae Star Dolly", which carries this title on the rim of the cylinder. These cylinders were supplied by the Averill Company. The doll cylinders sold for thirty-five cents each and are light blue celluloid over a cardboard core. They are 2 3/16 inches in diameter and 1 1/4 inches in length covered on one end with a metal plate with two round finger holes to facilitate removal of the cylinder from the mandrel. The cylinders are identified with various markings such as: Averill Manufacturing Co., New York City, U.S.A.; Universal Talking Toys Co. Newark N.J. U.S.A.; The Mae Starr Dolly (a paper label with the song title and number), while some labels have no markings whatsoever. It is believed that the Indestructible Record Company of Albany, New York may have manufactured many of the cylinders, although a reference also cited the Universal Talking Toys Co. A fire destroyed the Albany plant in October of 1922 and we can only speculate on which company manufactured the cylinders after this date. We would appreciate any documentation regarding the source of these cylinders. Phonograph dolls and toys were made to enchant children. We just published a book on the history of talking toys, from Thomas Edison’s first talking doll in 1890 to digital talking dolls and toys of the 21st century. This soft cover book covers over eleven decades and features over 500 colour photographs illustrating talking dolls, children’s records and phonograph toys. Treasured toys from major collections throughout the world are illustrated in this book. A price guide is included. To the children who played with these wonderful talking toys, however, they are priceless.